You are at:Home»How to install»How to create a new ‘Multiplet Report’ format? How to create a new ‘Multiplet Report’ format? The user will be able to change or create his own multiplet report templates; by following the menu ‘Script/Edit Script’. From Mnova 5.3.2, it will be possible to easily add new multiplet scripts to the Mnova interface (multiplet menus for example). 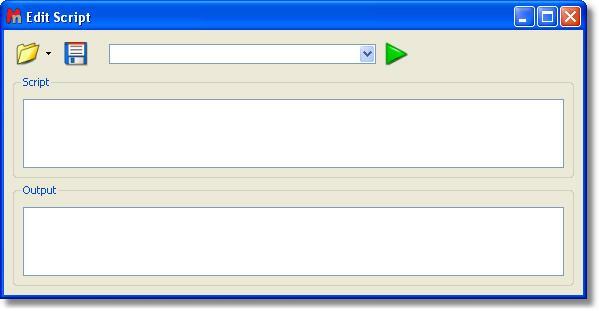 This enhancement in the script feature will make the handle of the scripts easier for the user. It will be easier to share your scripts with another users and with this new feature it will be possible to add new possibilities in the future. You can see below how to add a new multiplet reporter to the Mnova GUI. 1. Follow the menu ‘Script/Edit Script’ to launch the ‘Script editor’. See below how to edit this script. 4. The script will be automatically added to the Mnova GUI (for example, to the ‘Multiplet Table/Report Special/Setup’ menu). This will allow you to select the ‘Multiplet Report’ format for your analysis. Of course, you can add as many different scripts as you need. To obtain the multiplet range in ascending order, just replace the rangeMin with rangeMax in the below line of the script: shiftStr = this.rangeTemplate.argDec(multipletrangeMax, 0, ‘f’, this.deltaPrecision).argDec(multiplet.rangeMin, 0, ‘f’, this.deltaPrecision); It will be possible to select a multiplet report format as the default one, without allowing the user to modify it, just by removing the two slash symbols (before this sentence:Env.DefaultMultipletReporter = “My Multiplet Reporter”;). Please bear in mind that if you do that, you will not obtain any dialog box when you follow the Menu ‘Multiplets Table/Report Special/Setup’. 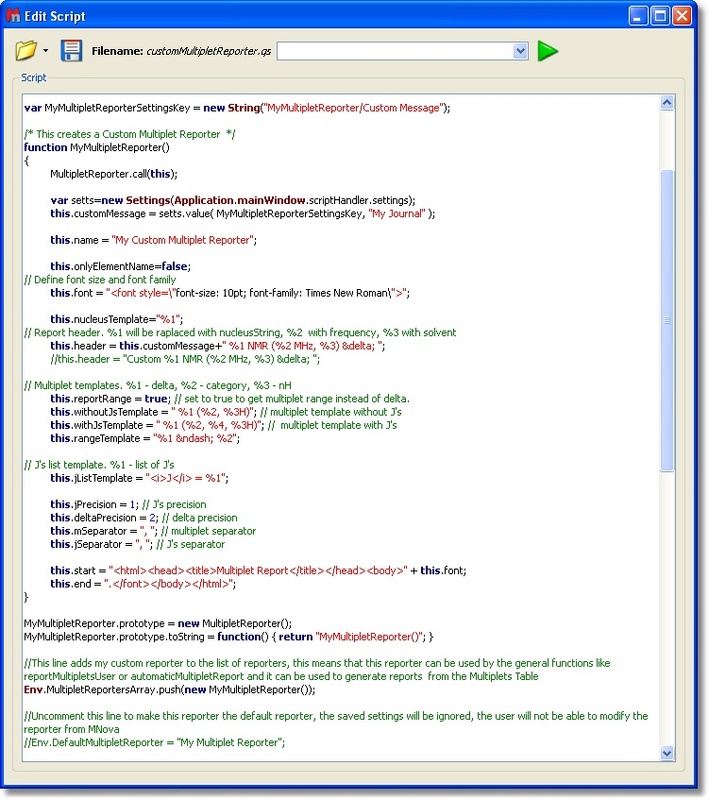 Indeed, the variable ‘Env’ contains several environment variables which can be used to customize the Mnova behaviour. Typing print(Env) in the Script editor, you will get the list of the available variables. In the example below, we have only defined the ‘Setup’ of the ‘Multiplet Reports’. All the remaining variables are ‘undefined’. 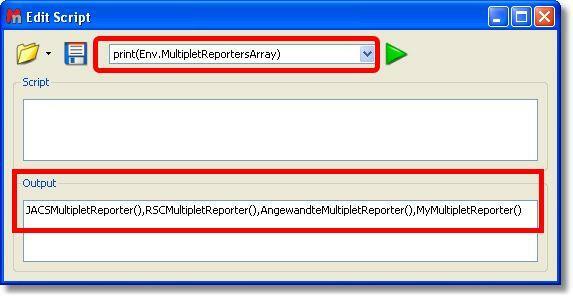 You can define the ‘DefaultMultipletReport’ variable by uncomment this line in the script: Env.DefaultMultipletReporter = “My Multiplet Reporter”; Doing that, the user will not be able to modify the multiplet report. 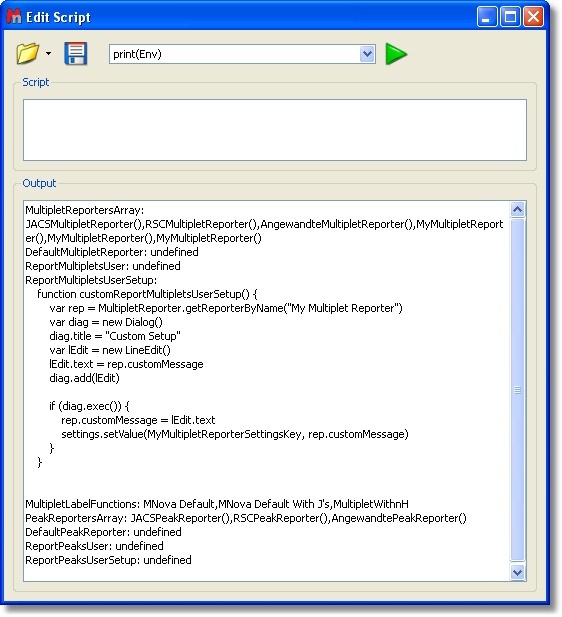 You can define the ‘ReportMultipletUser’ variable by uncomment this line of the script: Env.ReportMultipletsUser = customReportMultipletsUser; Defining this variable, you will have a format for the ‘multiplet report’ and the ‘copy special’ and another different (the default one) for the report which appears on top of the ‘multiplets table’. 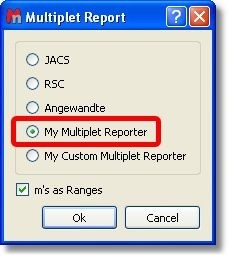 The ‘ReportMultipletUserSetup’ is the variable defined in the menu ‘Multiplet Table/Report Special/Setup’ for the ‘Multiplet Report’. The ‘MultipletLabelFunctions’ are different options (showed in the ‘Multiplet Properties’ dialog box) which allow the user to customize the information which appears in the multiplet boxes.